Contemporary style kitchens follow the latest design trends, where tradition and innovation merge. Particular attention is paid to the different surfaces composing them, and to the elegance of each and every detail. Customisation of contemporary kitchens is mostly guaranteed by latest-generation materials and also involves total look and minimalist aesthetics, two aspects that are always very popular, independently from the choice of colours and textures. Kitchen surfaces are one of the elements on which designers focussed to create the best possible solutions for contemporary kitchens. Materials like porcelain stoneware represent the present and the future of kitchen countertops, worktops and surfaces on which daily meals are prepared. Porcelain stoneware combines the aesthetic choices made available to the clients and the resistance of a material that is really unique. 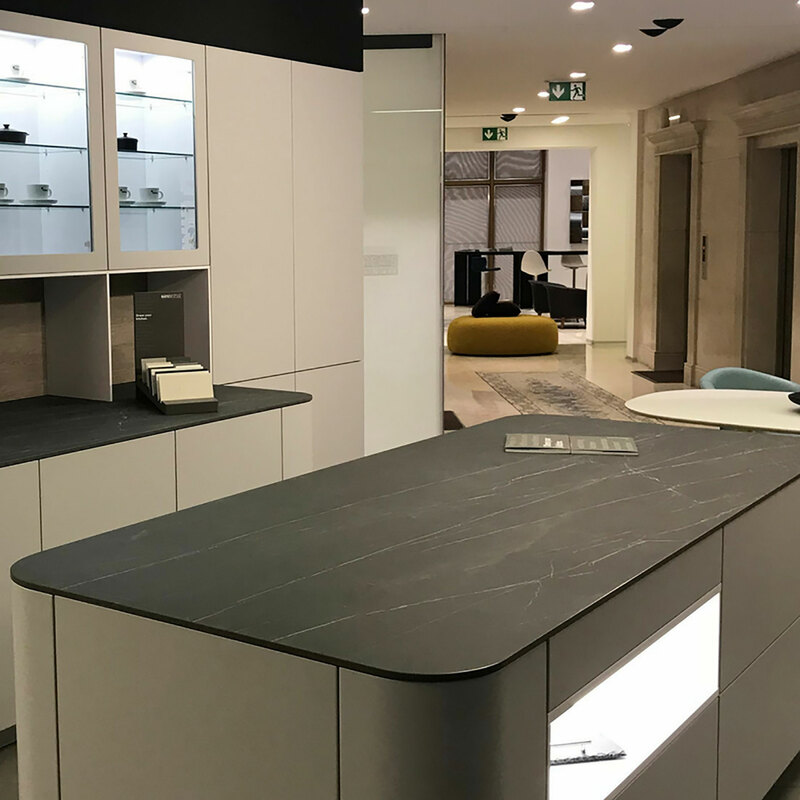 For this reason, Iris Ceramica Group focussed its over ten years’ experience on its new brand, SapienStone, entirely devoted to contemporary kitchen countertops and surfaces. With its stone, marble and concrete effects, SapienStone offers a vast colour range, allowing it to find the right balance between the needs of the kitchen and personal tastes. If the aesthetic characteristics of Iris Ceramica Group porcelain stoneware products are without a doubt the best choice on the market in terms of ceramic cladding, thanks to the variety of their colours, shades and veins, the SapienStone kitchen countertop stands out in the technical ceramic world thanks to its unique technical performance. Indeed, SapienStone is a countertop characterised by ceramic clays and unalterable mineral colours which do not suffer “the effects of heat, light or use of chemical cleaning and disinfection products”. For a normal countertop, these are all the main risk and wear factors. In the case of SapienStone, the quality of solid porcelain stoneware overcomes these issues, while at the same time helping carry out the standard kitchen activities. In fact, pots, coffee-makers and any other containers at high temperatures can be directly placed on a SapienStone top. Moreover, since these are hygienic and non-absorbent surfaces, food can directly be placed and sliced or cut on them, without any other support. Their resistance to scratches, detergents, acid products and standard corrosive agents is far better than any other material available on the market. Clearly, these aspects are fundamental for the everyday life. Just think of the preparation of fast meals: users will not have to deal with surfaces that can easily get dirty, scratched or stained. Of course, the use of SapienStone is not limited to private houses, but can also be extended to all restaurant activities where food is involved. It is the case of the recent interior design of Madrid-based gourmet bakery Le Bec Fin, whose interiors were designed by architect Mar Méndez Ortiz de Zárate, in collaboration with interior designer José Ángel Obeso and CUPA STONE, SapienStone exclusive distributor in Madrid. The desire to create an exhibition space enhancing both the preparation and the tasting of sweets led to the choice of the SapienStone Malm Black and Calacatta surfaces. 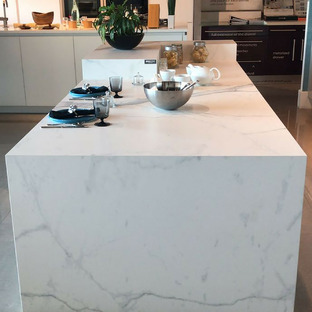 In particular, Calacatta Statuario, in its natural finish, was chosen for the space dedicated to the exhibition and packaging of products, and shows extreme elegance and formal sophistication thanks to its ivory white tones, crossed by grey veins. Malm Black, instead, once again in its natural finish, was used for the areas dedicated to snacks and the shelves, to enhance the distinctive and contemporary strength of the surface, inspired by dark metals.